The Campaign against Euro-federalism, CAEF, was founded in 1992 to address the labour and trade union movement and win it back to the anti-EU position it held from the 1960's until 1988. This is the year when Jacques Delors sold the myth of Social Europe to the trade union movements in Denmark, Ireland and Britain in exchange for support for the European Union. This was in the run up to the Maastricht Treaty, single market and single currency. The labour movement has organisations which represent, in one way or another, the aspirations of the vast majority of the population which is working class. There are still organisations, trade unions and political parties in the movement who oppose the EU. The media ignores us. Perhaps this will now change. However, one thing is certain: we'll not win this referendum without the labour movement. CAEF's position stands firmly on the right of nation-states to self-determination, national independence and democracy. The EU is the antithesis of democracy. It is a superstate governed by EU institutions. We all need to make clear that there is the continent of Europe or the European Union, not 'Europe'. A pub quiz question could be: "Is Norway in Europe?" The Commission is unelected, unaccountable, the executive and legislator. The EP is presented as the EU's democratic face it can't raise taxes, an army or police force and cannot legislate. The Council of Ministers and EU Summits use a Qualified Majority Voting system in which Britain has 12.6% of votes and has to gain support from 15 other Member States. QMV shifted power away from smaller populated Member States to the largest. The European Court of Justice overrides national courts and parliaments. Some judgements have come out against collective bargaining and for the free movement of labour. In Lille, France, is the European Rail Agency where legislation for rail privatisation and other rail packages are prepared and passed on to the Commission and national governments to put in place. Directive 91/440 was used to privatise the railways. There was a Directive to privatise postal services and so on. EU laws and legislation were changed from an intergovernmental system to a superstate and a Union by the Lisbon Treaty or European Constitution. In Britain we never had the opportunity to discuss this Treaty before ratification. If we want to leave the EU it is the Lisbon Treaty which must be discussed, not the charade of the trivial reforms played out today. Meantime the European Commissioner for Trade is negotiating undemocratically the secret Transatlantic Trade and Investment Treaty (TTIP) with her counterpart in Washington. TTIP and the Inter State Dispute Settlement (ISDS) tribunals overarch the EU with the object of bolting together the EU and US markets with poorer regulations on food, labour conditions and wages, and so on. ISDS gives transnational corporations powers to take governments to these anonymous tribunals. Tobacco firm Philip Morris took the Australian government to this court for removing advertising on cigarette packages for loss of profits, likewise the Egyptian government for daring to raise the minimum wage. The claws are out via TTIP and ISDS to grab and privatise the NHS for the largest lobby group in the US - the health and pharmaceutical companies. TTIP and ISDS override national parliaments and national democracy. There is a growing movement across the EU against TTIP and ISDS. 250,000 demonstrated against TTIP in Berlin. A petition signed by over three million against TTIP has been lodged with the European Parliament. 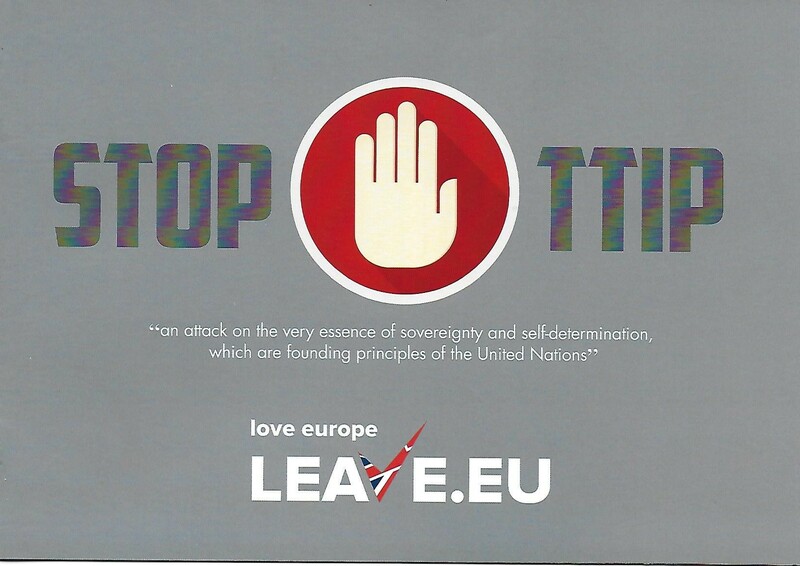 The TUC and most trade unions oppose TTIP. Despite all this opposition these same institutions support the EU. A complete contradiction. You cannot be both against TTIP and for the EU. Democracy only works within nation-states not between them. There is no democracy between Britain and Greece or any other Member State. The EU cannot be democratic despite talk about correcting the democratic deficit. The way the EU operates is to take away the powers of national governments, parliaments and at the same time cull national democracy and our hard won rights as the electorate to tip out those who govern us. To date the world is run with nation-states having the right to self-determination and national democracy. There are more nation-states today than ten years ago. The nation-state is here to stay: it is not a 19th century anachronism. Those who want an end to nation-states and national democracy are those forces behind TTIP, ISDS and the EU. Britain as a nation-state to function to the benefit of the peoples' of Britain must have control of its own borders, must be able to control its: fisheries and the sea underneath; protect its industries and jobs involved; control our borders to decide who comes into Britain. That means bringing an end to the free movement of labour in order to protect wages and stop the 'race to the bottom' first coined by the trade unions. These are the concerns of all who work for their living and their trade unions. The free movement of labour and immigration are different issues. Both require control of Britain's borders. Since the 1975 Referendum the deindustrialisation of Britain is all but complete. We had a coal industry, steel industry, shipbuilding and manufacturing. We traded across the world. These industries were the backbone of the economy which created wealth to pay for all the public services such as the NHS and the welfare state. There are 1,680,000 people currently unemployed in Britain, many of these are young people. We have soup kitchens and food banks. The alternative to EU membership is to have an economy based on manufacturing, associated industries and to trade across the world including nation-states in the EU, instead of an economy based on the financial and service industries which got us into deep water. That's in addition to being locked into a crumbling crisis-ridden EU. We need to stay out of the euro. Regarding jobs for example, part of the alternative outside the EU lies in Africa, India and Pakistan which need electrification. We should make this equipment and other manufactures. We need a merchant navy to carry these goods, a steel and ship-building industry. We can together discuss and together work out a rational future for Britain and its peoples. CAEF says the only way to oppose TTIP, ISDS, rule by Brussels and the free movement of everything is to dump the Lisbon Treaty. This referendum is not a game of football with red and yellow cards. We must show the red card to Messrs, Juncker, Tusk, Schultz and Cameron. Get them off our pitch in a massive vote to leave the EU. On behalf of all those in the labour movement who oppose the EU I wish you all well in all sections whatever constituency you represent in the campaign to leave the EU. * 10,000 pamphlets have already been distributed and a further 50,000 will be available soon.